How on earth do you inject personality and expression into a beautiful bear so that it looks incredibly real? 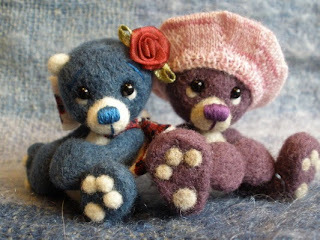 It's a question I need to ask Liza of Little Handfuls, because, when you gaze at any one of her gorgeous needle-felted bears you would swear they were about to speak! Let's find out more about these one-of-a-kind cuties and their maker..
Until recently I was a 30 something stay at home Mum, working on the weekends at a ladies clothing store with my youngest of 3 just starting school! I decided that life was changing and I needed to take charge so looked into taking up my dream of studying to be a Kindy teacher! So this year, I have just found out, that I will be entering into study for the next 3 years from July! Until now I would have said that my days consisted of picking up and dropping off kids, housework and attempting to create in the moments between. Now I am unsure of what lays ahead of me, and while that is uncommonly scary for me, I am also looking forward to it very much! 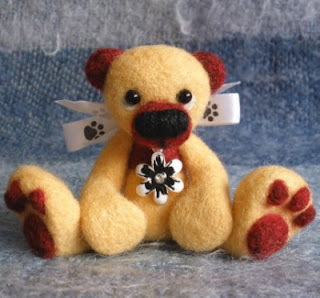 Needle felting has become my passion, since I first picked up a needle 6 years ago I have been in love. The passion may wane from time to time, but it’s always there and often gets me through tough times! Actually, apart from throat lozenges (seem to be perpetually lumbered with a painful throat lately) and my lamp, I have a Nielsen scanner unit charging! What is that you may ask! Well I am lucky to be a member of the Nielsen family, I scan my groceries every week, along with other items as required and earn points! It takes ages but I am looking forward to my gift certificates! Actually often the wool itself really gets me going. If I am feeling a bit low in the creativity stakes I get looking for a new wool, something different and exciting! That often gets the ideas flowing. Also another great thing is my customers, they will come up with something interesting or challenging for me to try and I just love doing that! We are often both surprised with what I come up with! There are free workshops or events in NZ??? Tell me where! Lol I can’t think of anything you don’t have to pay for. My regular events are the Hamilton Arts Circle in Feb which has some amazing work and street performers, and the Hamilton Doll and Bear show in May which is sadly on the decline! I may do Dunkleys in Hamilton this year, but not confirmed yet! Well, ask me that last year and I would be able to say I do ok! My creative work is done late at night mostly, I’m rather a night owl and tend to work away until I can’t see properly anymore, then I know it’s bedtime! But, as mentioned above, this year is going to be different and I have no idea how my weekend job and my crafts are going to get the attention they deserve! I once made a bear that turned into a duck! He’s great, big yellow beak and webbed orange feet! His name is Ducky. Kinda both, I have a desk, but it’s in the lounge surrounded by baskets of wool with bears etc on every surface! 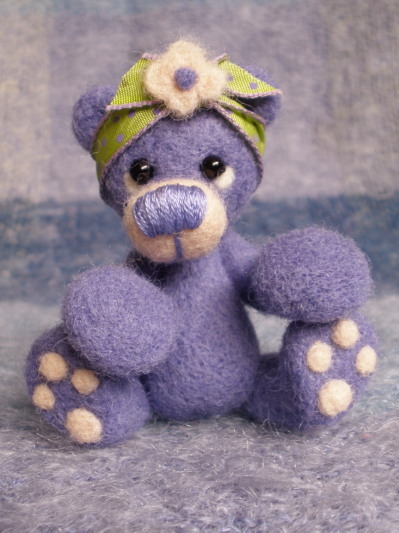 To see more of the Little Handfuls range, you can visit the website here , and Felt page here and follow on Facebook here.